Taking a minimalist approach for his recordings, Nakajima uses simple source sounds which are fed into his system, then heavily processed into a vast, dimensional, landscape of sonic textures. These source sounds can range from the organic sounds of gurgling water, to isolating elements of technology, such as the curious hum of luminous lamps. The result is a mixture of controlled manipulation and beautiful accident. Since May of 1992, Nakajima started and continues to operate G.R.O.S.S., his own cassette label dedicated to releasing experimental music and noise, in addition to his own recordings as Aube. He has worked on recordings with artists from Japan, Europe and the United States, and has designed packaging for many other releases. This interview was conducted over the course of trading letters with Nakajima via the postal system. What is the history of Aube? Since 1980, I have been recording electronic music by myself. mainly for my own pleasure. I did this using analog synthesizers and some effects—very much like a home taper. In 1990, I met some contemporary artists in Japan who I became friends with. They asked me to come up with a soundtrack to be used for their art installations on exhibition. At that time, their installations involved water. So, I came up with the soundtrack, using water sounds with some sythesizers. I consider this to be my first real recorded work. I made and released a total of four cassettes for them. However, these were not recorded as Aube. In 1991, I came into contact with some Japanese noise artists and what they were doing. The owner of Vanilla Records was interested in my previous works and he asked me to release a cassette on his label. This is when Aube began. The first appearance as Aube was a track titled Torpedo which was released on the Come Again triple 7 inch compilation. Do you have any traditional music training? Since 1975, I have been a great fan and avid collector of ‘70s German electronics and experimental music such as Amon-Duul I and II, Ash Ra Temple, Can, Faust, Kraftwerk, Neu!, Popol Vuh, Klaus Schultze, Tangerine Dream and others. I still really love it. I am a fanatic collector of anything by Kraftwerk, as Mason can attest to! I discovered industrial, post-industrial, avant garde and noise music somewhere in the mid ‘80s and enjoy much of that as well. Do you enjoy any traditional Japanese music? What does Aube mean in English? Aube is actually a French word. It has several meanings, such as “dawn”, “water-turbine”, “white cloth”, “the river’s name” and so on. What are your intentions or concepts for what you produce as Aube? My concept, using the name Aube, is to design and record sounds using limited materials for each recording. Why do you use mainly water sounds for your recordings? I don’t use only water sounds. I use many other things as well; such as: florescent lamps, glow lamps, field environmental recordings at limited locations, small oscillators (usually Voltage Controlled Oscillators), voices, pulminary sounds, sounds from brain wave scans, and others. It’s just that many of my water recordings were released first. There seems to be an element of musiqe concrete in your recordings. For example, the sounds of construction and then also destruction used on the Frequency For Collapse cassette. Would you agree? Well, let’s just say that I wasn’t ignoring those ideas for the recording. What about the Luminous cassette? I wanted to capture the essence of only the sounds coming from the light. To me, sometimes, the quiet sounds from such lamps can become very noisy in a quiet and dark room. I made that cassette in order to help others imagine the distinct sound of the light coming from the lamp. 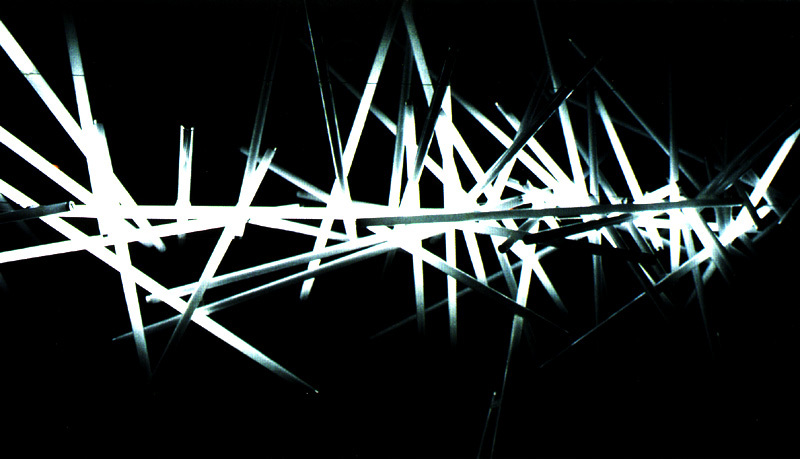 Contrasting the idea of exposing the sounds of the light, the cover artwork is all black, except a single luminous line of tape that runs down the center. You can see the light from this much better in the dark. Looking back on all of your releases, has Aube changed or evolved? In essence, Aube hasn’t really changed or evolved, so much as the actual techniques for recording have. This is mainly because I have since upgraded some equipment, and I have acquired some new effects which I have added into the process. What made you decide to start up a cassette label? I wanted to release my own recordings as well as those of my favourite artists for the purpose of giving them greater exposure. As for why I chose cassettes… I like the cassette format very much. It is easy for me to produce and design them. Do you have any goals for G.R.O.S.S.? To release a total of 100 cassette titles. Many of the cassettes look as if the packaging has been designed on a computer. How do you produce them? All of my releases for G.R.O.S.S. are hand made. This includes everything—the packaging, mastering, copying and other things. I do use the computer for making the designs, but I do not rely solely on computers. I don’t really like computers much. I’m always making sure to use my hands (and my head) for my designs. The computer is just a tool and as such, it is only one of many tools that can be used the same as a pencil or a ruler. Do you have any influences for your package designs? No, not really. I am an industrial designer and I now do freelance work. I studied industrial design at Kyoto University of Art. After I graduated, I worked at a dental and medical equipment manufacturing company for four years. I also worked for two other industrial design offices for five years. During these nine years together, I designed many different products. That is really the scope of my influence. Japanese graphic design is often very simplistic in nature to begin with, specifically the use of type. Do you have an interest in typography and how it is incorporated into your designs? I like simple typography. The most important goal for my designs is to balance the spacing and typography. Why are all G.R.O.S.S. cassettes initially released in a limited edition of 50 copies on Metal type cassettes, followed by a wider release on regular Chrome type? My intent is to provide the highest of quality for all my releses. This is why I initially chose the Metal type cassettes. However, it is rather expensive to do so and I have since discovered that some people do not like the Metal type cassettes because some older players can’t play them. Instead, I now release the first fifty copies as Metal type cassettes. Overall, I feel the sound quality for all my releases is still very good. Would you like to work with any other artists or bands in the future? Yes, if they are interested in working with me. Would you like to give live performances in the United States? Yes, perhaps in the future.